BrainBuilder is a computer-based brain-fitness training program that is designed to assess and build auditory and visual sequential processing abilities. With as little as ten minutes of daily mental exercise powerful gains can be made using BrainBuilder in short-term memory and thinking skills. In an intensive series of adaptive, interactive exercises, BrainBuilder trains the brain to expand its ability to sequentially process auditory and visual information. Sequential processing is fundamental to all learning activities, communication, social interaction and higher order cognitive functions. Do you want to know the secret to improving your memory, attention, and BrainSpeed? Well now you can, with BrainBuilder®. Exercise Your Brain In Just Minutes a Day! The Coach will test your BrainSpeed, design your daily sessions, track your improvement, adjust your training program, and motivate you along the way. BrainBuilder offers numerous training levels, from Bronze to Master that you attain based on your BrainSpeed. Challenge yourself with each session, increase your BrainSpeed, and reach the next level! Brain plasticity is the brain’s natural ability to change itself. The brain has the ability to learn, adapt and grow when presented with the correct stimulation provided with the right frequency, intensity and duration. Scientific evidence demonstrates that engaging brain plasticity based training as provided within BrainBuilder can improve vital brain functions. 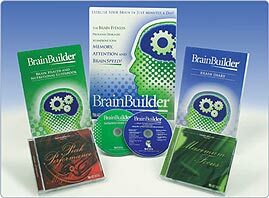 The exercises in the BrainBuilder program are precisely engineered to stimulate brain plasticity. Just like a good physical exercise program is important for a strong, healthy body, so is targeted mental exercised for a strong, healthy brain. By training with BrainBuilder, you will improve your ability to process visual and auditory information alloWing you to understand, respond to and remember what you see and hear with greater speed and clarity. The BrainBuilder exercises will train and improve mental abilities that decline as we age, contributing to better cognitive performance and brain health. Want To Tell A Friend About Brain Builder Family Edition!! !